From: The Endless Frontier: Reaping what Bush Sowed? Note that while for a time, UC may be one of the more protected upper-tier institutions, continued squeeze on the federal budget will ultimately not insulate us. And someone will have to pay off bonds floated on the hopes of continued revenue. Anyone in UCOP or at the Regents paying attention? *The Bush referred to in the title is not George H.W. 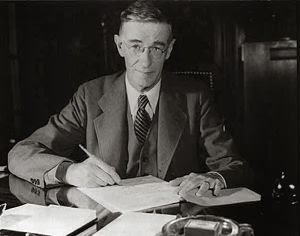 and not George W. It is Vannevar Bush, FDR’s science advisor, who wrote a report entitled “The Endless Frontier” in 1945. His photo is above. Previous Previous post: Lessons from Berkeley’s White Elephant Stadium for UCLA, the Regents, and UC?